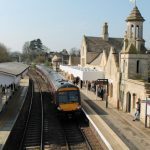 As part of the Railway Upgrade Plan, Platform 1 at Stamford Station in Lincolnshire was recently refurbished. 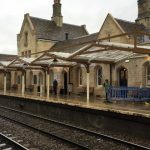 Careful consideration resulted in the use of Twinfix Multi-Link-Panels Non-Fragile to replace the old curved corrugated roofing of the canopy and the end result is more in keeping with the original age and design of this elegant Grade II listed building. 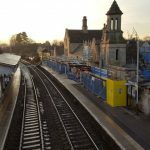 Passengers and staff are now all benefiting from the high levels of natural light that floods the platform. 110 sq.m. 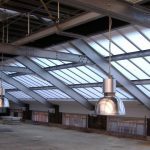 of Multi-Link-Panel Non-Fragile rooflights fitted with 6mm clear solid polycarbonate glazing, and including 12 No. 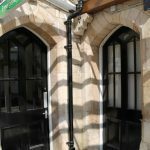 in-line Twinfix Access Hatches, all installed at 600 mm centres, and employing 50 mm wide glazing bars to the panel system. Pressed aluminium flashing and gutters. All aluminium powder coated to RAL 9910 matt. 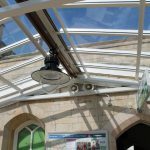 Multi-Link-Panel rooflights are light in weight; factory pre-assembled to minimise installation time and site errors; are quick to fit, minimising station downtime; and are non-fragile to ACR[M]001:2014. 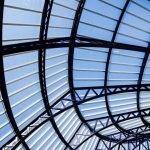 The solid polycarbonate glazing is transparent like glass, but is only half the weight of glass and is virtually unbreakable. 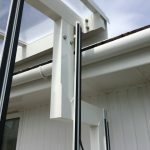 Inconspicuous in-line Access Hatches within the Multi-Link-Panels enable roof/gutter maintenance to be undertaken safely from below the glazing. 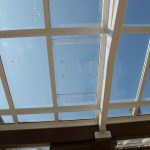 Can you spot an Access Hatch in one of our 6mm Multi-Link-Panel NF rooflights? 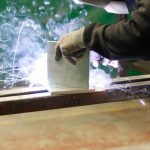 We are happy to report that we recently passed both our annual CE audit to EN 1090 and our six monthly ISO 9001 audit. 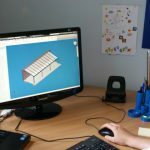 Everyone within Twinfix takes these audits very seriously, recognising that theses systems help us to create a safer workplace for us all here on our Warrington site and for our clients and our installers when they are out undertaking site work. 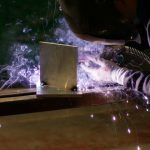 Long gone are the days when companies in building and construction could operate in the marketplace without achieving these stringent accreditations – and what a safer working world we now have as a result! Here at Twinfix we take health and safety very seriously. 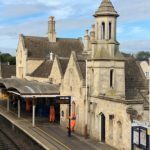 Read what director Sarah Kench has to say about how IOSH training is helping ensure that it is an integral part of our company culture and the many benefits that this brings. 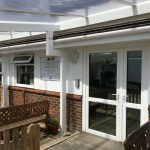 An 8m long Twinfix canopy installed on the front of the Lower Willingdon Pre-School Nursery in Eastbourne is proving a great success. With a 2.8m projection from the building and fitted with vertical glazing at both ends, Julie Langford, Nursery Manager, says it has made a tremendous difference to the nursery, with the extra space also being well used by the Breakfast and After School Clubs, as well as by parents dropping off and collecting their children. 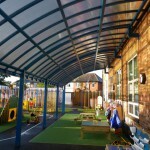 The nursery building was not suitable to hold a wall-fixed structure so a free-standing canopy was chosen, with front and back supporting posts. 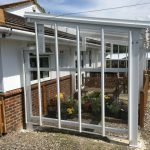 The Twinfix designers included a cranked feature within the back posts, enabling the mono-pitched glazed roof to over-hang the gutter and roof tiles. This helps to keep out driving rain and will enable easy maintenance cleaning of the rainwater system. 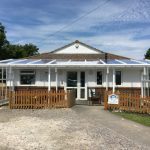 Manufactured in the Twinfix factory with an aluminium frame polyester powder coated in matt white (RAL 9910) the roof consists of Multi-Link-Panels NF fitted with clear 16mm multiwall polycarbonate to allow maximum light into the building. These glazed panels are Non-Fragile to the recommended roofing assembly test ACR[M]001:2014. 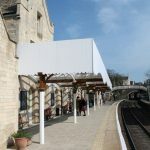 The vertical side glazing offers protection from the weather all year round whilst enabling vision into and out of the canopy. 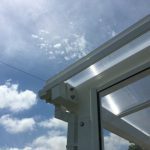 It comprises 6mm clear solid polycarbonate, that is virtually unbreakable, glazed with the Twinfix 286 bar system that has a hidden fixing within the capping bar. 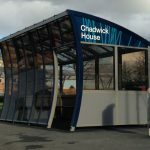 The canopy was installed by one of the Twinfix DBS (previously CRB) checked teams. 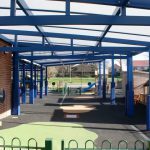 Aluminium is a great choice for a school canopy as it doesn’t rust in use, and will stand up to the test of time – and children!